Action - Ensure your wired or wireless network hardware is switched on and plugged in. Action - Before assuming your internet connection is faulty, try visiting several popular Web sites rather than just one. Action - To resolve an IP conflict, follow these instructions to release and renew your IP address. If your network uses static IP addresses, manually change your IP to a different number. Firewall software running on most computers is intended to prevent unwanted network traffic from disrupting its operation. Unfortunately, these software firewalls can malfunction and start blocking valid Internet traffic. When two software firewalls, such as Windows Firewall plus a third-party product, are installed on the same computer, contention between the two can also incorrectly block traffic. Action - If you've recently installed or upgraded software firewalls on your computer, temporarily disable them to determine whether it may be the cause of Internet connection problems. Are You Outside of Wireless Signal Range? The performance of Wi-Fi network connections depends on distance between the device and the wireless access point. The further away a Wi-Fi device, the slower the local connection generally runs, until it breaks altogether. Wireless signal interference in the area can also limit the effective range of a Wi-Fi connection. Whenever you're unable to reach the access point, you also can't connect to the Internet, obviously. Action - Use one of these options to measure the strength of your wireless signal and try these ideas to expand the range of your Wi-Fi. Has Your Wireless Network Configuration Changed? Wi-Fi networks with encryption options like WPA or WEP turned on require computers to use matching security keys when connecting. If someone changes the encryption keys or passphrase on the access point, devices that worked before will suddenly be unable to establish sessions and Internet connections. Likewise (though less likely), if the access point settings are changed to require using a specific Wi-Fi channel number, some computers may be unable to discover it. Action - Confirm the Wi-Fi channel number and encryption keys on your router have not recently changed (check with the network administrator if necessary). When using a hotspot, follow the provider's instructors for signing on carefully. Home networks that use broadband routers are easier to manage than those without one, but technical glitches with the router can also prevent computers from connecting to the Internet. Router failures are caused by overheating, excessive traffic, or simply an older unit going bad. Typical symptoms of a flaky router include computers on the network not being able to obtain IP addresses, or the router console not responding to requests. Are You Being Blocked By Your Service Provider? Internet Service Providers (ISPs) can choose to block access from your account if you fail to make payment or otherwise violate the provider's Terms of Service. Especially when using paid hotspots that charge by the hour or day, sometimes people forget to keep their subscription updated. Other common reasons an ISP might block your account include exceeding bandwidth caps, sending spam email, and downloading illegal or inappropriate content. Action - Contact your ISP if you suspect your account has been blocked. Computers, too, suffer from technical glitches. Although relatively uncommon nowadays, a computer's network adapter hardware might suddenly fail due to overheating or age. Failures in the operating system software that control the adapter, on the other hand, can occur frequently especially with computers that are heavily used. Viruses and worms also may disable or block a computer's network interfaces from functioning properly. Finally, if using a laptop or other mobile device, transporting it from one location to another can corrupt the state of its network. Action - Check the computer for malware and remove any found. On Windows computers, try resetting the network connection. Reboot the computer if necessary. Those using satellite Internet service may notice they can't connect to the Internet during periods of very bad weather. Providers in dense urban areas (including cellular Internet carriers) sometimes are unable to support peaks in network traffic that causes sporadic outages for some customers. Finally, those who subscribe to newer or more complex forms of Internet services (such as fixed wireless broadband) may experience more downtime than others as providers encounter more issues with relatively less mature equipment. Action - If all else fails, contact your Internet provider to verify whether they are experiencing an outage. 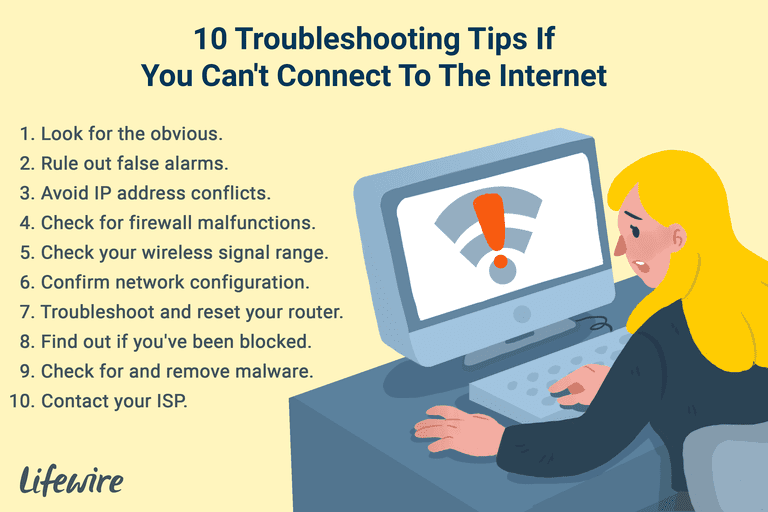 Some providers also give advice on troubleshooting problems connecting to their network (sometimes for a fee).